Sen. Jeff Merkley talks about 2020 and the things that keep him up at night. Last election cycle, Sen. Jeff Merkley, D-Oregon, was the only one of Sen. Bernie Sanders’ Senate colleagues to support his presidential primary campaign against former Secretary of State Hillary Clinton. Now, Merkley is actively exploring a run of his own -- telling “Powerhouse Politics” podcast hosts ABC News' Rick Klein and Mary Bruce that he won’t defer to Sanders or anyone else. Merkley also said his family is on board if he decides to run. "They had a veto over the project, and they have all now given it a thumbs-up,” he said. He said he plans to make his decision in the first three months of 2019. The Democrat said there are three things that keep him up at night as he considers forming the potential backbone of a campaign for president: political corruption, "climate chaos" and making sure the country invests in families, instead of giving tax breaks to the rich. (Don Ryan/AP) Sen. Jeff Merkley speaks during a rally in Portland, Ore., Oct. 17, 2018. As a member of the Foreign Relations Committee, Merkley weighed in on Trump's announcement that he is withdrawing U.S. troops in Syria. Merkley said he wants to hear more details and expects a classified briefing soon. But his initial response was one of support for the White House. "I start from the premise that engaging in a long-term presence in Syria poses a significant hazard,” he said. “It's always hard to end an operation once it's begun and there has to be a moment when you re-evaluate and say it's time." He is stridently opposing the Trump administration on the handling of migrants who come to the U.S.-Mexico border. He recently returned from a second trip, in the last six months, to the Texas border and said he was appalled by what he saw. 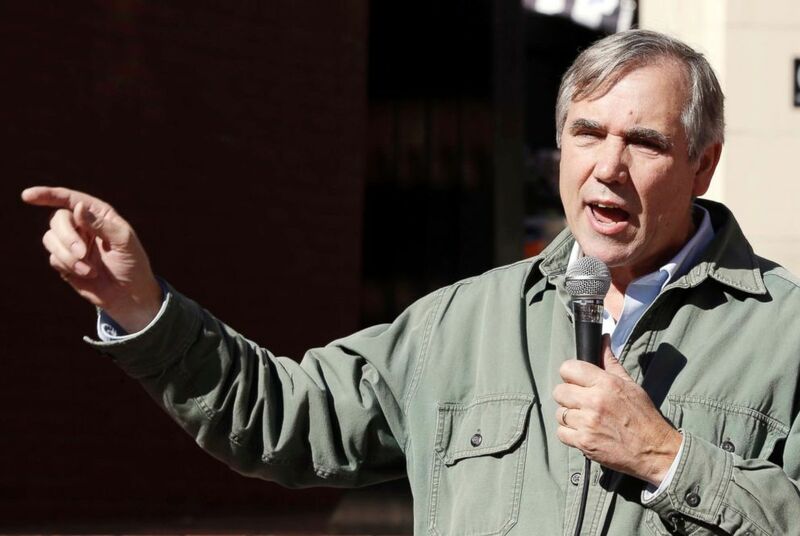 "It was six months ago that I went down to the border to shine a light on the fact that children were being torn out of their parents arms," Merkley said. "The outcry from the American public and from the courts shut that down. But the president announced that if he couldn't tear children out of their parents arms, he wanted to lock them all up together. This also is unacceptable." He wants to shut down the tent encampments at the borders and accused the Trump Administration of creating a strategy of harm. "In fact Jeff Sessions our former attorney general laid it out. He said he wanted to send a message through the treatment of those who come to our borders to discourage people from even considering the possibility, if they're fleeing oppression abroad of coming to the United States," the senator said.